I gave up street evangelizing a long time ago. It was a short-lived career; a few weekends into town with a friend, praying for God to help us meet someone we can share Jesus with. It quickly (thankfully) became clear to me that this business of following God is much better done in the context of long-term relationships, with a broader understanding of salvation and mission. Any time we try to confine the big and beautiful Good News of God into a simplistic message, small enough to fit onto a tract or a ten minute awkward conversation, we cut out too many important details. The truncated gospel of the Four Spiritual Laws requires that we get to the point--Jesus is the Answer--as quickly as possible, lest our conversion, I mean, conversation partner gets away from us. For Jesus to be the Answer, there's got to be a problem and so we belabor the problem in order to solve it. The mathematical equation of the gospel made sense to me when I was a child and perhaps into young adulthood. Prove the problem and solve the equation. Everything was simple, organized, and neatly categorized. Somewhere along the way, it stopped making sense. Here's how: I didn't need all that convincing to know there is truly deep brokenness in our world. There was pain and loss wherever I looked, strife on the outside and turmoil on the inside. My heart breaks on an every other-daily basis, constantly gut wrenched by stories of betrayal, injustice, and numbing helplessness. I was a sheltered girl, raised within the walls of first world protections. It took me a while to venture into the harsh realities of life. So I get it. The world is in trouble and we need a Savior. But Jesus as the Answer? Too simplistic. If Jesus was the answer, why do deep brokenness continue to exist within the walls of the church? I won't speak for others, all I know is that I wrestle with the same demons day in and day out, and I've been a Christian for decades. I think sin is complicated. It is sometimes the moral failing of an individual's choices. But those choices are almost always inextricably bound in relationship with other individuals, which together form a web of complex dilemmas making it impossible to pinpoint where the moral responsibility lies. Other times sin is invisible. So many scandals of Christian leaders break out because much of their sins were hidden, masked by spiritual language and prestige. Then there is systemic sin, in which no matter how much our personal sins have been forgiven, ensnares us corporately on a daily basis: our complicity in a consumer society feeding upon greed, our participation in corrupting our environment, and our everyday purchases tainted by child and slave labors. When we preach that Jesus is the Answer, we have to be quick to prove it. And so the only stories that get told are the rags to riches, despair to hope, darkness to light stories. The complexities of sin are swept under a rug. We must keep the narrative neat and bound up in the problem/solution formula. I don't think Jesus was ever meant to be our Answer. Jesus entered into our Problem and he sat down and told us stories riddled with nuance and complexity, open to the interpretations of his listeners. Jesus entered into our Problem and doled out not just one solution, but many different sorts. Sometimes he would turn water into wine, other times he borrowed a boy's loaves of bread and fish and fed the crowd. He healed with mud and sometimes with words. There was no discernible pattern to the way Jesus moved about in our world. He was human, unpredictable and free. Jesus wasn't an answer, he was feeling and emotional; sometimes angry, and sometimes deeply compassionate. He didn't always give solutions. He engaged with dynamic characters who came across his path. Jesus was love. A sentiment, or action, or spirit, that has been elaborated by poets and artists throughout the history of humanity--boundless in its outworking, limitless in its applications. Jesus never came to be our answer, he came to bear our problems. He gave us some very important teachings, but he never spelled out an exact formula to take away the suffering of our sins. Jesus wasn't an answer, he came to give us promises and to show us love in his beautiful body nailed to a cross. 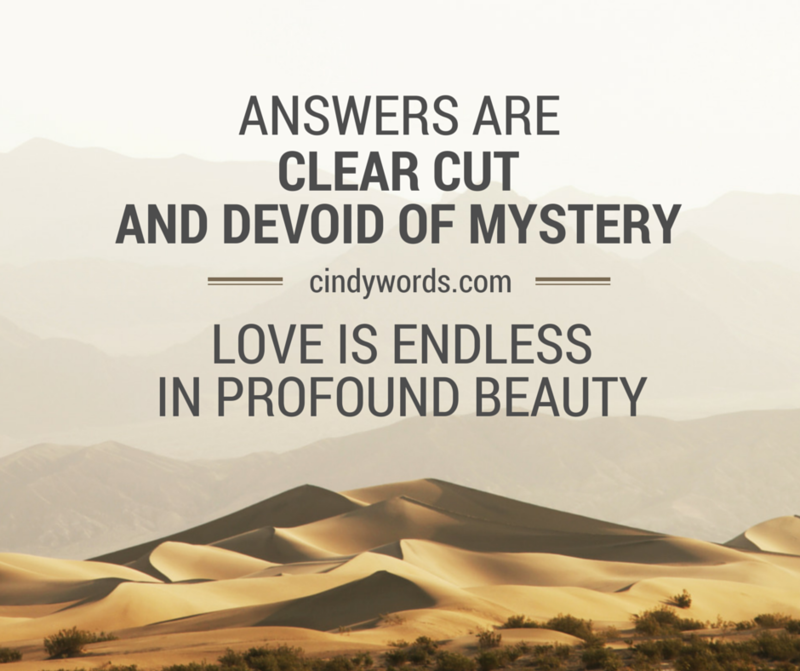 Answers are clear cut and devoid of mystery. Love is murky and nebulous, but endless in profound beauty. Answers are definitive and effortless. Love requires labor with no guarantees. Answers set up parameters and boundaries and gatekeepers. Love erases dividing lines and flings open gates. I cannot preach a Jesus who is the Answer. I'd much rather follow a God who demands vulnerability and risk to do the next right thing with courage. I don't want to solve our Problem with a formula, I want to create new ways to practice love in my own life and in our world. I don't want to be fixed. I want to remain soft and broken, much like my Lord on the cross. 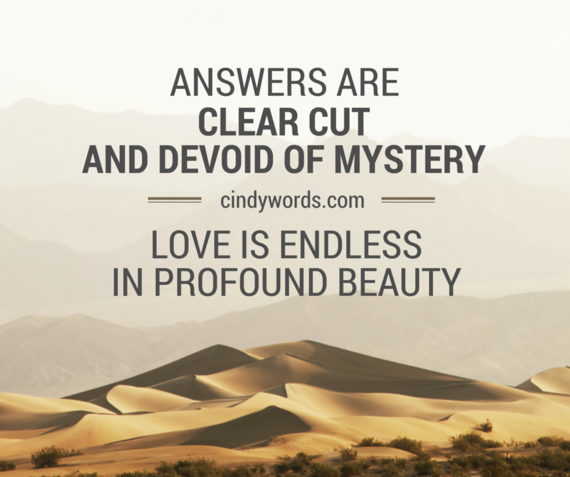 Sign up for Cindy's email list for newest writing updates.